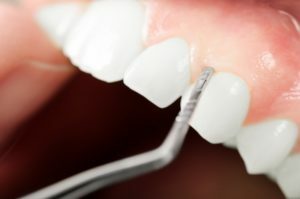 Do You Need Gum Disease Treatment in Duncanville? Did you know that gum disease affects around 80% of the American population at some point in their lives? This common disease starts with relatively harmless and reversible symptoms, but if left untreated, it can result in bone loss, bone damage, and loss of teeth. The key is to identify your symptoms early to prevent this disease from affecting your jawbone and teeth. Keep reading to learn whether or not you need gum disease treatment in Duncanville as well as some of the common signs and symptoms of this disease. Gum disease is an infection or inflammation of your gums and supporting tissue. The earliest stage of this disease, gingivitis, can be reversed through good oral healthcare at home like brushing and flossing, along with routine visits to your dentist. However, if your disease persists past the beginning stages, you have periodontitis. At this stage, your disease has the potential to not only damage your gums, but it can affect your jawbone and teeth, too. Also known as a deep cleaning, scaling and root planing involves cleaning away plaque and tartar from on and underneath the gumline. Then, your dentist will smooth out your tooth roots to make it less likely for plaque to collect under your gumline in the future. Your dentist can also use a periochip to eliminate bacteria under your gumline. By inserting a tiny yet powerful antimicrobial chip that dissolves over the course of a few days, your dentist can eliminate left over bacteria in your gums. Does it sound like your gums could benefit from treatment? Contact your dentist to get help for your oral health before the problem gets more severe. Dr. Carlos M. Martinez is a skilled dentist with a passion for providing quality care. He takes pride in offering gum disease treatment to help his patients look and feel better. He currently practices at Glow Family Dentistry, and he can be contacted through his website or by phone at (972) 298-2027. Comments Off on Do You Need Gum Disease Treatment in Duncanville? If you have any questions, please either call our office or complete the simple form below. We can’t wait to meet you and help your family find its new dental home!